"We estimate that Iron Speed Designer saved $20,000 in development cost on this one project alone. I like the fact that it injected three whole months back into the development timeline, shortening our release cycle significantly." - Rex Winn fo Code-frog System Architects, Inc.
Aviation Specialties Unlimited (ASU) provides night-vision goggles (NVG), night-vision flight training, and night-vision supplies to both U.S. and international customers. In addition, ASU installs custom equipment on rotor- and fixed-wing aircraft to facilitate night vision goggle approved flight. 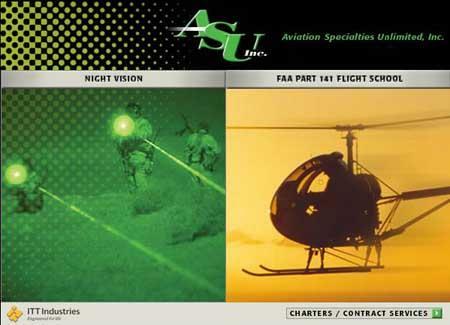 ASU's instruction in NVG-assisted flight with rotorcraft allowed the company to expand its business model into a flight school as well. An energetic database-driven Web site permitting real-time updates with change management and page restoration. Separate sites for night-vision products and flight training services based on a common model. Ability of users to register on the appropriate site and request information pertaining to training and NVG-related business needs. Presentation of a dynamic set of products and services for each visiting user, based on his location and intended use of the NVG products or services. Encourage users to submit video clips, news stories and other related media to either the NVG or flight school sites for publishing. Capability of tracking users signed on to the site and capturing data as they move around the site. Administration of both flight school and NVG content and data with one tool. Main page built dynamically using database content managed by Iron Speed Designer application. Request price quotes on Night Vision Goggle systems using a shopping cart interface. Request pricing for aircraft modifications (fixed-wing or rotorcraft). Request on-site NVG goggle maintenance. Request additional information or sign-up for chartered flight services. Sign up for e-mail newsletters. Browse available NVG-related products and services based upon their geographic location. See a customized list of upcoming trade shows in their area. Submit NVG videos and other material for inclusion in the Web site's public media gallery. Enroll in the Flight School training program. Sign up for an introductory flight to see if Flight School is a good fit for them. Request additional information on financial aid for flight instruction. Submit news, videos and Web-related articles that pertain to flight instruction or events. Make changes to dynamic content. View activity reports from each section of the Web site. Look up user-specific details, register users as customers, and dynamically add them to the site's list of active customer profiles. Add additional products and services that immediately appear in profiles of users qualified to use them. Mark content as expired so it will no longer show. Control access to the back-end tools, add users and roles, and moderate changes made by users of lower rank in the system. ASU administrator is comprised of three separate databases and 60 database tables. One particular table has more than 250 columns. Including front-end and back-end Web pages, Iron Speed Designer created approximately 150 of 180 ASPX pages. The project took six months to complete with four software engineers and one graphics designer working on it. Development with Iron Speed Designer represented about one month of effort -- but saved us three months' worth of work. That's a huge savings in both cost and time! FCK Editor embedded into an Iron Speed Designer application page where edits are made and saved to the database. We wrote about 10,000 lines of customized code for ASU Administrator, using ComponentArt WebUI 3.0 for the custom controls not provided by Iron Speed Designer. 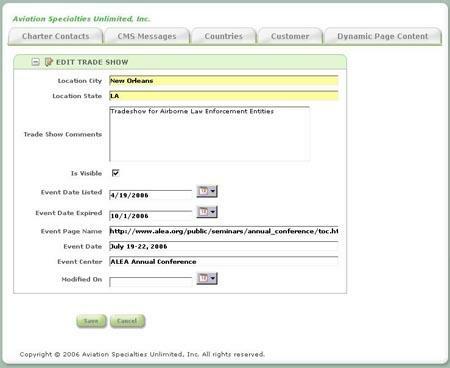 We used FCK Editor for the WYSIWYG editor for the CRM part of the site. Most of the customized code created a part manifest that allowed users to build out requests for products and pricing of replacement parts and systems. Iron Speed Designer was brilliant there. We profiled more than 40 fully made systems of 400 replacement parts, manuals, cases and supplies. To make code customization as easy as possible, I set up the third-party controls (CA:Sitemap, CA:Grid, CA:Snap, CA:Menu, CA:Multipage, CA: Calendar, FCK Editor) in a plain or slightly stubbed out ASP page in Visual Studio .NET 2005. I wrote all the behavior and configured the XML files and related properties in Visual Studio .NET 2005. When ready, I simply ported the code into Iron Speed Designer. It was totally flawless; I never had a single problem and I pretty much just copied from Visual Studio .NET 2005 into Iron Speed Designer. The customizable classes in Iron Speed Designer are a piece of cake to work with. Since I'm familiar with ASP, I didn't need to use the Code Customization Wizard at all. Iron Speed Designer's built-in design themes were perfect for what we needed. We didn't need to create new design themes. Modifying the CSS style sheet was very simple and straightforward. Page customizations involved shopping cart manifests; WYSIWYG site editors incorporated the FCK Editor and user registration forms. Creating user registration and information-based forms could not have been easier. When you combine FCK Editor and Iron Speed Designer, the result is an almost instant CRM tool that will work well for almost any Web site. The code customizations involved are quite painless. We used Iron Speed Designer to build almost an entire Web site! We estimate that Iron Speed Designer saved $20,000 in development costs on this one project alone. I like the fact that it injected three whole months back into the development timeline, shortening our release cycle significantly. The Iron Speed Designer code doesn't need debugging either; it just works. Standard Iron Speed Designer page, no customization needed. ASU has about 20 users so transaction throughput is not high. The metric for success was how much more quickly the job was accomplished. The slam dunk was that I could release code like that in less than a day and it was immediately in production. Within a few weeks, we had a working database design. Iron Speed Designer wrote about 80% of the code we needed for the CRM application in just under 30 minutes. The complexity of the system and the number of tables involved resulted in Iron Speed Designer creating roughly 125 fully functional ASP.NET Web pages that performed all the necessary Create, Insert, Update, Delete functionality we needed. Without Iron Speed Designer, the project would have taken nine months or more. ASU would not have started the project if development costs were not significantly reduced by Iron Speed Designer. We saved a full three months (possibly more) and well over $20,000 in project time and cost. 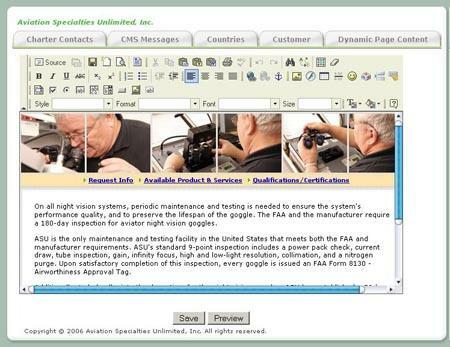 Aviation Specialties Unlimited (ASU) contacted me to help them design a CRM tool for their new Web site. My first proposal of costs and features involved was too high for ASU, and the company pressed hard for me to come down in price. They wanted to work with me, but had a tight budget for development. I had previously formed a great relationship with the staff at ASU, so I looked on te Web to find a tool or product to significantly reduce my development time and allow me to lower my quote to ASU. During the course of my search, I found many different products claiming to build database-driven ASP.NET Web sites. However, when I downloaded and tested these applications, each seriously lacked what I needed. So I kept searching, using Google and other tools. One evening, I happened to see a banner ad for Iron Speed Designer at The Code Project, a site dedicated to programming in many languages and products. I eagerly followed the banner to the Iron Speed site, but wasn't sure I could believe what Iron Speed Designer promised to deliver. I initiated contact with Iron Speed and requested an evaluation of Iron Speed Designer. I received my 15 day evaluation and began work on a site mock-up to see if the rubber really met the road. My first build was from Iron Speed Designer V3.1 Enterprise Edition. The entire experience took me about 20 minutes to build a full-blown Web site application. I was impressed. From the outside, it looked very good, but looks aren't everything. I began to examine the actual code. I was very impressed by the structure, encapsulation and the generic design. My initial impressions were that this was an extremely flexible product. I picked what I believed to be the most complex form and I started stepping through the various layers of the application. I was very impressed to see how the user interface presented a tabbed view of all aspects of the ASP.NET code, which allowed me to conveniently examine any piece of the application. I loved that I could see the base classes, stored procedures, and even my database -- all from inside Iron Speed Designer. I was shocked to discover that this application was indeed for real and did what it claimed. A few days later, I spoke with my contact at Aviation Specialties Unlimited and walked her through the test application I had created using Iron Speed Designer. She was immediately impressed at how much fully functional code there was. I could see that Iron Speed Designer had really started her gears turning with ideas. With the positive feedback from her, I was able to lower my own rate, shorten my development timeline significantly and remove magnitudes of complexity from the system. I got a signed agreement from them a few days later and began work on the site. Both the client and I were very impressed by how easily Iron Speed Designer performed certain tasks. If you are considering doing a complex CRM tool for a dynamic site, and don't use Iron Speed Designer, you are throwing away money and time. With Iron Speed Designer, you can create all your data-related code with just a few mouse clicks. You can quickly customize the specific pages you need, and you can add in third-party controls easily. Let Iron Speed Designer handle all of your C/R/U/D functionality. You can easily change the CSS, and all the Iron Speed Designer graphics are in the images directory. There's nothing you cannot do. If you are building CRM tools for clients, you *NEED* to be using Iron Speed Designer and that's about all there is to it. ASU has big plans for Iron Speed Designer. ASU is a growing company and there's ample room and need for internal applications to run the company's intranet to manage inventory, maintenance, operations and other needs. Iron Speed Designer was a huge hit and has certainly made a name for itself. I've already completed three large projects in Iron Speed Designer and am wrapping up work on my fourth. As I've gotten more used to code customization, I examine every project I take for Iron Speed Designer potential. Iron Speed Designer saves me so much time and delivers so much perfection, I'm a total fool if I don't find a way to use it. What makes Iron Speed Designer so amazing for me is that four of my client companies have benefited from Iron Speed Designer. My reputation has increased, and it allows me to take on larger projects I may not have been able to do on my own before. It's a major cost savings for me. I've been working on computers since 1987 when I had a Macintosh Apple IIe with a 20 megabyte external hard drive. My background is computer science with lots of systems experience in C/C++ on Windows platforms. Distributed architectures are my forte, but I work well in just about anything. I've been self-employed since April of 2004 and have not looked back. I'm happily married with three children and am very motivated to exercise and achieve better health for a longer life.